Seattle again was the market with the fastest month-over-month decline in October — 1.1 percent. Only seven other cities saw median home prices drop month to month, and none of those fell more than 0.4 percent. Phoenix edged past Seattle to join Las Vegas and San Francisco as the three metro areas with fastest-climbing home prices in October, as the nation’s housing market cooled. Seattle for nearly two years led the 20-city S&P CoreLogic Case-Shiller index in annual price growth for homes, but falling prices here in recent months have now dropped it to fourth place, according to the latest data released Wednesday. 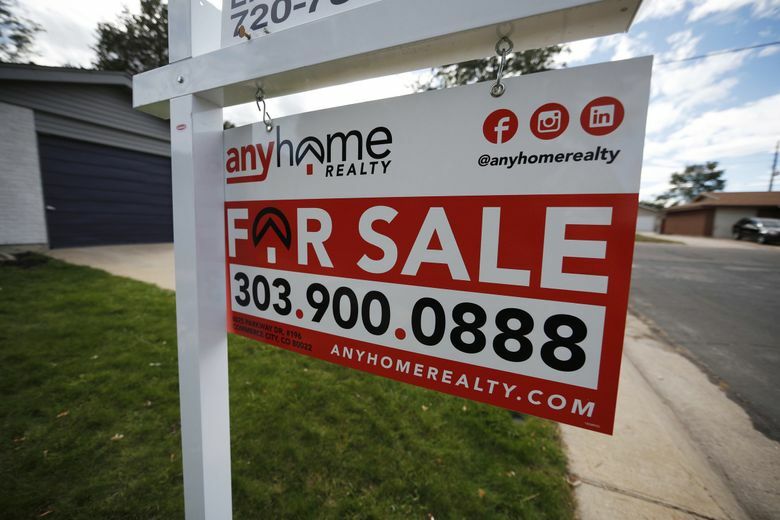 The 20-city index rose 5 percent from a year earlier, down from an annual gain of 5.2 percent in September, according to the Case-Shiller report Wednesday. The Seattle metro area’s year-over-year increase was 7.3 percent through October. 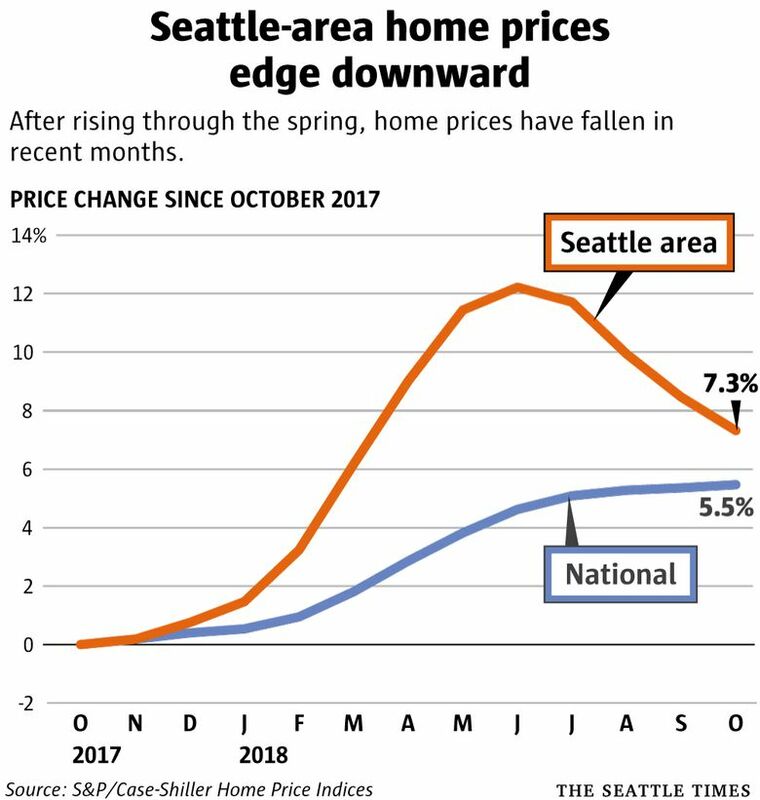 But in recent months Seattle prices have actually dropped: 11 percent over six months through November, according to sales data from the Northwest Multiple Listing Service. That reversal again made Seattle the market with the fastest month-over-month decline in October — 1.1 percent. Only seven other cities saw median home prices drop month to month, and none of those fell more than 0.4 percent. Home prices nationally have eased in many markets during recent months as would-be buyers are struggling to afford homes. Prices have consistently climbed faster than wages, a challenge that was overcome until last year by historically low mortgage rates. But borrowing costs began to rise last year after President Donald Trump cut taxes by increasing the budget deficit and the Federal Reserve hiked interest rates. In Seattle, other factors may be contributing to the sharp reversal from last spring’s record prices, including a record-breaking streak of apartment construction, a decline in interest by Chinese buyers, and uncertainty about the tech sector here in the wake of Amazon’s plans to add major growth centers elsewhere. Six of the 20 cities reported accelerating increases, meaning prices rose more for the 12 months ending October 2018 than for the year ending September 2018. Las Vegas, one of the epicenters of the housing bust that caused the U.S. economy to collapse into a recession at the end of 2007, has made a surprising comeback. The Nevada tourist destination has found new ways to grow as the market began to recover.